IP Phone Warehouse, the most trusted name in VoIP resellers, is announcing the new series of IP phones from Sangoma. The only phones designed for FreePBX and PBXact, Sangoma’s new phones feature Zero Touch connection and built-in VPN capabilities. This new series builds on Sangoma’s deep experience with open VoIP telephony to provide purpose-built endpoints for FreePBX and PBXact deployments. IP Phone Warehouse, the most trusted online VAR of VoIP technology, is proud to announce the first line of IP phones from Sangoma. This new series builds on Sangoma’s deep experience with open VoIP telephony to provide purpose-built endpoints for FreePBX and PBXact deployments. Pre-order the new Sangoma IP phones from IP Phone Warehouse today. IP Phone Warehouse is an authorized online reseller of Sangoma technology, and backs up every sale with certified sales representatives and low prices. 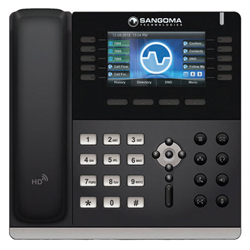 Sangoma’s new IP phones range from entry-level to executive, yet each phone shares advanced features. They all support the open SIP protocol, giving the customer great flexibility in terms of deployment options. Every Sangoma phone is Power over Ethernet (PoE) compliant to reduce infrastructure complexity. Each phone includes 5-way conferencing for simple collaboration, wideband audio for natural-sounding voices, busy lamp field (BLF) functionality, and a full-duplex speakerphone for hands-free talking. They all include built-in virtual private network (VPN) capability. Sangoma’s phones are the first to be specifically designed for FreePBX and PBXact systems. FreePBX is the most widely deployed open source PBX in the world, a graphical user interface (GUI) that manages Asterisk. PBXact is its commerical version. When a new Sangoma phone is plugged in, Zero Touch technology automatically directs it to Sangoma’s PBX for configuration, entirely removing the hassle of provisioning from the customer. Sangoma s300 is an entry-level phone for basic users, featuring 2 SIP accounts and dual 10/100 Mbps Ethernet ports. Sangoma s500 is a mid-range phone for office or cubicle workers, featuring 4 SIP accounts, 8 line keys and dual Gigabit Ethernet ports. Sangoma s700 is an executive phone for power users, featuring 6 SIP accounts, 10 line keys and dual Gigabit Ethernet ports. For a full breakdown of the different features of the Sangoma phones use IP Phone Warehouse’s Sangoma comparison chart. Sangoma’s expertise in business communications technology is well-established. Their telephony cards, session border controllers and gateways are relied upon around the world. Communications endpoints are a logical extension of the Canada-based company’s knowledge. IP Phone Warehouse is proud to support Sangoma’s entry into IP phones. Contact IP Phone Warehouse by phone at (888) 201-9056 or by email at service (at) ipphone-warehouse (dot) com to learn more about the new line of VoIP phones from Sangoma. IP Phone Warehouse is the most trusted online reseller of VoIP technology. We are authorized online resellers of IP phones, IP-PBXs, video conferencing equipment, network security cameras, and much more. With expert pre- and post-sales customer support, same day shipping, and unbeatable prices, IP Phone Warehouse is the website of choice for businesses looking to acquire the many benefits of enterprise VoIP.